Eric Clapton has been confirmed as one of headliners for next year’s Barclaycard presents British Summer Time at London’s Hyde Park. He’ll take to the stage on July 8, where he’ll be joined by special guests Santana, Steve Winwood and Gary Clarke Jr – with further artists to be announced in due course. Clapton first played at Hyde Park in front of 120,000 people with Blind Faith in 1969 alongside bandmates Winwood, Ginger Baker and Rick Grech. 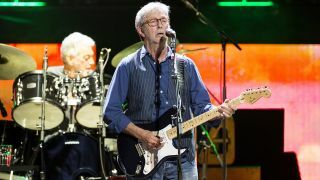 Slowhand returned in 1996 and again in 2008. Last month, it was announced that Roger Waters would bring his Us + Them tour to Hyde Park on July 6. Head of events, filming and commercial development at the Royal Parks, Alun Mainwaring says: “Since 2013, BST Hyde Park has become the homecoming for the world’s greatest artists. There will be a Barclaycard pre-sale today (November 27) at 9am and an Amazon pre-sale on November 29 from 9am. Tickets will go on general sale from 9am on December 1. The Many Faces Of Eric Clapton: ‘God’ speaks!